A short & sweet post today (it’s my birthday! ): here’s another ‘transition’ type of look as the temperatures continue to drop: simple matching neutrals with my new favourite sweater & old favourite shoes, paired with pops of cobalt and tweed- two of my favourite fall trends! p.s. Make sure you enter to win some great statement jewelry from Jeweliq here. I’ll be drawing for three winners after this Friday! great oufit, those heels are super cute and look so comfy! Love the layering and love the pop of colors! You have amazing legs. Please can I have legs like yours?! I love how your sweater matches your shoes :)! Also the tweed adds a lovely texture to the outfit! you look adorable! the sweater is amazing! Happy birthday! Love the layers! Happy birthday! Hope you have an extra special day celebrating with D.
Happy birthday Jen! Hope you have a wonderful day. PS: Love this look! Layers!! Rejoice! You look lovely and these pictures are so gorgeous. Looks so cozy yet so chic! Happy birthday gorgeous,have a wonderful day.Love you outfit you look stunning. Happy Birthday! Love your outfit specially your tweed shorts. This look is adorable! 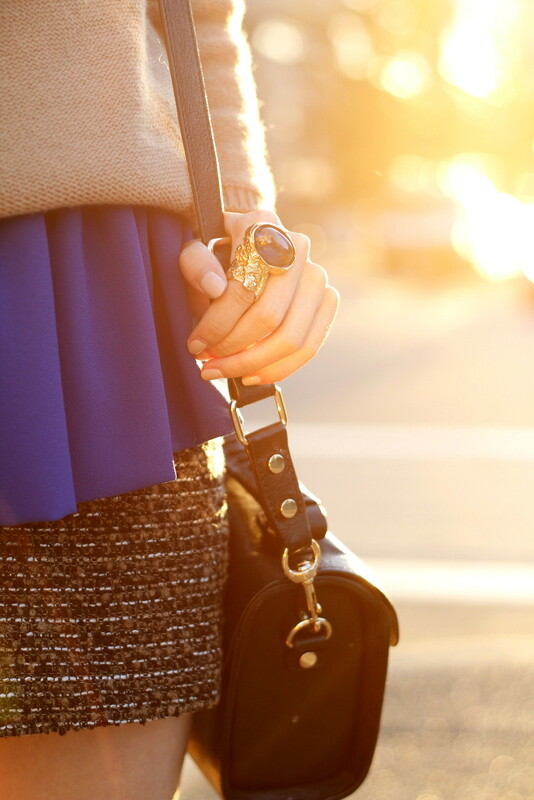 I am absolutely loving the cobalt blue trend this fall. It’s awesome how you added the unexpected pop of it under your black and tan sweater. And more importantly, HAPPY BIRTHDAY!! Happy Birthday! You look absolutely stunning in that outfit. 🙂 In fact, you always look so pretty no matter what you wear! I hope you have a fantastically happy birthday! You look lovely! Happy Birthday Jen! I hope you have an awesome day! You look really sweet in these photos! Happy birthday Jen! I love the Fall themed two-toned sweater paired with the electric blue underneath. Happy (belated!) birthday, Jen! Hope you had a fantastic day! I absolutely love the layering of the top and your sweater to offset the sweater from the shorts! Yay! Today is my birthday too! Wishing you a gorgeous birthday .. lovely pictures .. Have a good one. Really love the shape and structure of your bag! Happy birthday to you! You look great and the knit sweater looks so good with your shoes <3 Amazing! 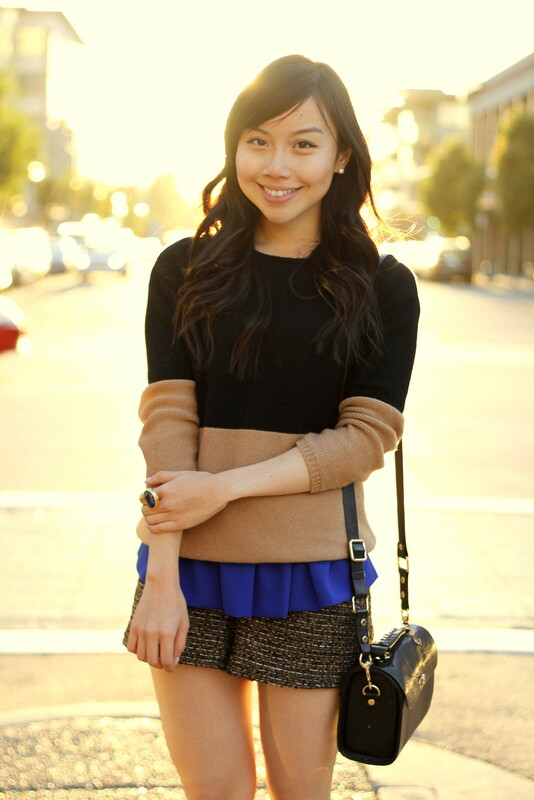 The colorblocked sweater is perfect with the tweed shorts! You dont take one bad photo eh? Just gorgeous- and that sweater.. ahh so cozy but so cute! I’m only reading this now, but happy belated birthday, Jen! Hope you had an amazing day. These photos are beautiful, as always. Photos number 3 & 4 are STUNNING, Jen! So gorgeous, I love the lighting and you just look so pretty!